A tropical haven of coconut palms and striking architecture, our luxury hotel in Sri Lanka is situated where the Kalu Ganga meets the Indian Ocean. While Sinhala, Tamil and English are widely spoken in Sri Lanka, our resort staff are happy to assist you with the following languages of choice – French, Arabic, Hindu, English, German, Afrikaans and Thai. 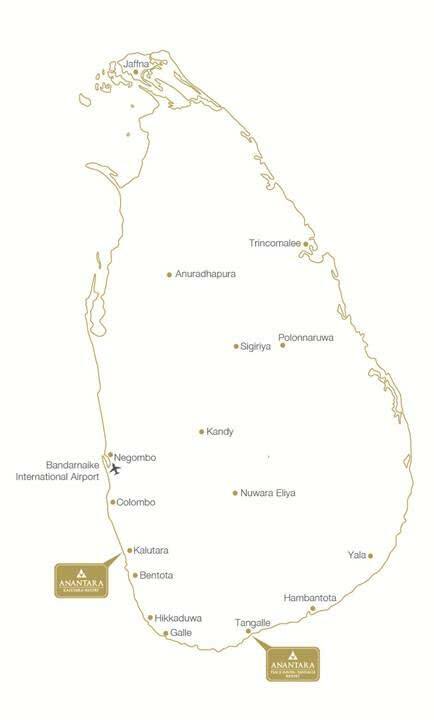 Anantara Kalutara is a 60-minute drive from Colombo, and a 90-minute drive from Bandarnaike International Airport via a scenic route of lagoons, lush waterways and rural countryside. For seamless journeys to and from the resort, Anantara offers a luxury chauffeur service. There is a seaplane transfer once a day between Bandaranaike International Airport and the lagoon. Guests can also charter private seaplane flights to the resort. Private helicopter charters between Colombo and Kalutara are available, with car transfers included. Take the Southern Expressway heading towards the Dodangoda Interchange. At the interchange, turn onto Kalutara-Matugama Road, bearing left at the Nagoda Junction and following the road until the end at Katukurunda. There, turn left, then right onto St. Sebastian Road. The resort is on your right. For guests wishing to experience Sri Lanka’s famously beautiful train journeys, the Kalutara South Railway Station is a 10-minute drive from the resort. We will be happy to arrange a pick-up service for you.